Jennifer is in pain as her powers overreact. Gambi arrives in time to restrain her powers; he tells Jennifer to enter her safe space. Lala shoots at Gambi, but he walks away. In the dream space, Perenna tells Jennifer to snap out of it and get out of them. Jennifer powers down, but Gambi passes out from absorbing too much power. Anissa and Jennifer take Gambi away while Jefferson looks into Tobias' location. No one is charged in the death of the metahuman kid. Tobias plans to use the community's anger to cause a frenzy and kill Black Lightning. Black Lightning finds the pod kids in Tobias' lair. Anissa and Jennifer bring Gambi back to the sanctum. He's alive, but he needs to cool down from the energy exposure. Anissa wants to be Blackbird and use her abilities to fight crime. Cutter mobilizes the 100 to make the next strike. She worries that Tobias is losing his mind after seeing him talk to Tori's painting. Dr. Jace pulls a gun on Black Lightning, but Lynn fights her and wins. Dr. Jace makes a deal with Black Lightning and Lynn for local police protection in exchange for information on powerful metahumans. Agent Odell surprises Lynn in Tobias' lab. He plots to take all of the pod kids; she warns him that moving the kids will destabilize them. Freeland erupts into chaos as people riot over Cape Guy's death. The power goes out across the city. Gambi wakes up from the attack; he reaches Jefferson, but his suit is at low battery. Gambi agrees to let Jennifer come with him to help repower the suit; she agrees to keep a calm head. The teleporting bouty hunter kidnaps Dr. Jace for his client: the Markovians. Thunder and Black Lightning fight the MODs. The pastor suffered the poisoning from Cutter. He conducts a service for the community of Freeland. Lala shoots Heatstroke to death. Lala reveals that he's going to kill Tobias. New Wave traps Thunder in a water bubble and Coldsnapp freezes Black Lightning. Gambi and Lightning head to the Freeland power plant. Lightning uses her abilities to power up the machine that's been frozen under a block of ice. The machine is powered up and the city is lit. 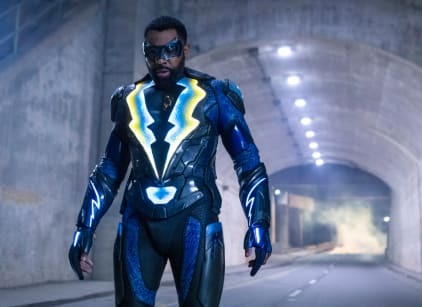 Black Lightning's suit is recharged. He and Thunder use their abilities to knock out New Wave, Shakedown, and Coldsnapp. Tobias plans to release everyone from the pods; Cutter begs him not to do it. The two fight. Instead of Cutter killing him, she spares his life and breaks up with him. Before Lynn is able to administer the serum, the pod kids are released. They're in a state of half-sleep and could be erratic. The group believes Agent Odell will start claiming pod kids. Gambi and Lightning trace the location of the briefcase to Tobias' apartment. Lightning disobeys his begging and uses her powers to fly from the van to the location. Lala ambushes Tobias in the apartment; he shoots and fights him, but it has no effect on him. Tobias triggers a code to cause ALL of Lala's past victims to burn tattoos on him to knock him out. Lazarus Prime brought him back, but it was Tobias who brainwashed him. Lightning breaks into Tobias's apartment and uses her powers to attack him. Black Lightning's powers can't stop Lightning from hurting Tobias. She gives up after seeing her powers hurting Black Lightning. Tobias tries shooting them, but the gun isn't loaded. Black Lightning fights him and knocks him out. Reverand Holden performs a sermon thanking Black Lightning and Thunder. He encourages the community to rise up and bring Freeland back to its glory. Agent Odell has Issa Williams, Wendy Hernandez, and Khalil trapped in pods. Tobias is placed in "The Pit," a top-secret metahuman prison that is off any records where his abilities won't be accessed. Lynn reveals that many of the pods kids are still missing. Jefferson breaks down in tears over his family surviving and being together. Agent Odell enters the Pierce house and reveals that he knows everything about their secrets. The Markovians have a large stockpile of metahumans and they're planning a war against Freeland since the city has a resurgance of metahumans from the pods and Green Light. Agent Odell needs their help.